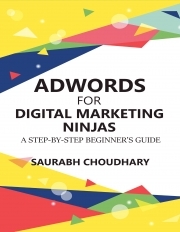 Description of "Adwords for Digital Marketing Ninjas"
If you are new to PPC ads and are looking for a step-by-step guide for Google Adwords, this is your go-to book. A perfect book for Google Adwords beginners, explaining each and every step that you need to run your first campaign and optimize it too. This is the ultimate guide for those who want to dive into AdWords basics to learn and apply the techniques and tactics to run Adwords campaigns. The book provides insight into AdWords' functionality and it's features, explaining how they work and providing tips, tactics, and hands-on tutorials, which readers can immediately use on their own PPC campaigns. The book has detailed step by step explanation of every feature of Adwords along with screenshots for easy understanding. I am Saurabh Choudhary, a digital nomad, a geek who lives in the web world. Reviews of "Adwords for Digital Marketing Ninjas"